With so much bad music making its way to the top of the charts, and major record companies continuing their never-ending attempts to exploit anything that smacks of trendiess, it is perhaps ironic that this would be such a favorable time for the proliferation of outstanding singer-songwriters. As a reaction to the commercial music scene, and helped a great deal by the ease of releasing CDs independently, there seem to be more first-rate, intelligent folk-influenced singer-songwriter records being issued than ever before. They may not be selling in the millions, but such records are finding an audience among Baby Boomers who recall the folk scene of the 1960s, and a younger generation ready for music that is honest, thoughtful, literate and likely to sound good after today's trendy flavor of alternative rock or slick pop has long been forgotten. The main problem is that there are just so many good singer-songwriter records coming out that it is hard even for a reviewer to keep track of them, let alone the average music fan. This surfeit of folkie CDs has also raised the standard to the point that albums considered excellent a few years ago would now just be average. This week we have another singer-songwriter album that raises the benchmark even further. 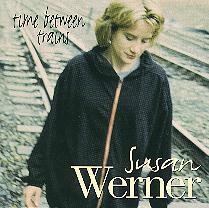 It's the new fourth recording by Susan Werner, entitled Time Between Trains. It combines excellent writing, world-class musicianship and some of the most tasteful production I have heard in the genre, from an artist who has already been gaining great critical praise. Susan Werner was born in Iowa and raised on a farm. She took up the guitar at age five, and eventually music became her academic endeavor. She earned her Master's degree in classical music at Temple University in Philadelphia, a city where she has since been based. After graduation from college, she worked a series of temporary jobs before deciding to take up her guitar again and plunge into the revived folk music scene. She quickly began to attract attention, landing several gigs in folk clubs. Her following has been growing ever since, helped by quite a bit of touring, both on her own, and supporting such artists as Joan Armatrading and Richard Thompson. She plays full time now, performing over 200 dates a year. Her independently released previous albums, Midwestern Saturday Night and Live at the Tin Angel from 1993 soon became critics' favorites, and led to a major-label deal and the album Last of the Good Straight Girls. The recordings illustrated her rare combination of wonderfully appealing vocal style, great guitar and piano work, and songwriting marked by both sensitivity and wit. Despite some memorable songs on her previous releases, I think Time Between Trains is her best album yet. Her writing is more mature, and she has become even more adept at balancing the wry with the ability to make a telling point. But perhaps most attractive about this album is the flawlessly tasteful production and arrangements by multi-instrumentalist Darrell Scott who really enhances the songs with a wonderfully eclectic collection of acoustic instruments, and also seems to draw from Ms. Werner her best recorded vocal performances in this Nashville-made album. In addition to Scott, some of the other players joining Ms. Werner include Nashville drummer extraordinaire Kenny Malone, and acoustic bassist Viktor Krauss, brother of bluegrass celebrity Alison Krauss. There are other players who appear from time to time, including a trumpeter, a violinist and a bagpipe player, but for the most of the record, the four provide the laid-back and often sparse, but sometimes swinging arrangements, which range from mellow and folky to sleekly jazz-influenced, to bluesy, to even something resembling a tongue-in-cheek tango. Susan Werner's new fourth album Time Between Trains is her best yet. She has come up with another outstanding batch of songs that demonstrate why she is on so many people's short lists of bright lights on the singer-songwriter scene. And making this album even more special is the exquisite production by Darrell Scott, who added just the right musical settings to the songs while staying almost entirely in the acoustic realm. As a producer, Scott also got some of the best recorded performances out of Ms. Werner that I have heard, especially vocally. The album is a real gem. Sonically, Time Between Trains is also first rate. The sound is bright and up-close, which is just right for the sparse acoustic instrumentation, and the lack of studio effects allows the subtleties of the performance to come through. The dynamic range is also decent for a major-label-distributed release, though skipping the compression added in the mastering process would have made it even better.